Dilophosaurus (/daɪˌloʊfəˈsɔːrəs, -foʊ-/ dy-LOHF-o-SOR-əs) is a genus of theropod dinosaur that lived in what is now North America during the Early Jurassic, about 193 million years ago. Three skeletons were discovered in northern Arizona in 1940, and the two best preserved were collected in 1942. The most complete specimen became the holotype of a new species in the genus Megalosaurus, named M. wetherilli by Samuel P. Welles in 1954. Welles found a larger skeleton belonging to the same species in 1964. Realizing it bore crests on its skull, he assigned the species to the new genus Dilophosaurus in 1970, as Dilophosaurus wetherilli. The genus name means "two-crested lizard", and the species name honors John Wetherill, a Navajo councilor. Further specimens have since been found, including an infant. Footprints have also been attributed to the animal, including resting traces. Another species, Dilophosaurus sinensis from China, was named in 1993, but was later found to belong to the genus Sinosaurus. At about 7 meters (23 ft) in length, with a weight of about 400 kilograms (880 lb), Dilophosaurus was one of the earliest large predatory dinosaurs, though it was smaller than some later theropods. It was slender and lightly built, and the skull was proportionally large, but delicate. The snout was narrow, and the upper jaw had a gap or kink below the nostril. It had a pair of longitudinal, plate-shaped crests on its skull, similar to a cassowary with two crests. The mandible was slender and delicate at the front, but deep at the back. The teeth were long, curved, thin, and compressed sideways. Those in the lower jaw were much smaller than those of the upper jaw. Most of the teeth had serrations at their front and back edges. The neck was long, and its vertebrae were hollow, and very light. The arms were powerful, with a long and slender upper arm bone. The hands had four fingers: the first was short but strong and bore a large claw, the two following fingers were longer and slenderer with smaller claws, and the fourth was vestigial. The thigh bone was massive, the feet were stout, and the toes bore large claws. Dilophosaurus is a member of the family Dilophosauridae along with Dracovenator, a group placed between the Coelophysidae and later theropods. Dilophosaurus would have been active and bipedal, and may have hunted large animals; it could also have fed on smaller animals and fish. The function of the crests is unknown; they were too weak for battle, but may have been used in visual display, such as species recognition and sexual selection. It may have grown rapidly, attaining a growth rate of 30 to 35 kilograms (66 to 77 lb) per year early in life. The holotype specimen had multiple paleopathologies, including healed injuries and signs of a developmental anomaly. Dilophosaurus is known from the Kayenta Formation, and lived alongside dinosaurs such as Megapnosaurus and Sarahsaurus. Dilophosaurus was featured in the novel Jurassic Park and its movie adaptation, wherein it was given the fictional abilities to spit venom and expand a cowl on its neck, as well as being smaller than the real animal. It was designated as the state dinosaur of Connecticut in 2017. Dilophosaurus was one of the earliest large predatory dinosaurs, a medium-sized theropod, though small compared to some of the later theropods. Slender and lightly built, its size was comparable to that of a brown bear. The largest known specimen weighed about 400 kilograms (880 lb), measured about 7 meters (23 ft) in length, and its skull was 590 millimeters (1.94 ft) long. The smaller holotype specimen weighed about 283 kilograms (624 lb), was 6.03 meters (19.8 ft) long, with a hip height of about 1.36 meters (4.5 ft), and its skull was 523 millimeters (1.716 ft) long. A resting trace of a theropod similar to Dilophosaurus and Liliensternus has been interpreted by some researchers as showing impressions of feathers around the belly and feet, similar to down. Other researchers instead interpret these impressions as sedimentological artifacts created as the dinosaur moved, though this interpretation does not rule out that the track-maker could have borne feathers. 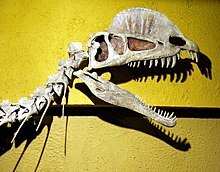 The skull of Dilophosaurus was large in proportion to the overall skeleton, yet delicate. The snout was narrow in front view, becoming narrower towards the rounded top. The premaxilla (front bone of the upper jaw) was long and low when seen from the side, and its outer surface became less convex from snout to naris (bony nostril). The nostrils were placed further back than in most other theropods. The premaxilla was weakly attached to the maxilla (the following bone of the upper jaw), only connecting at the middle of the palate, with no connection at the side. Hindwards and below, the premaxilla formed a wall for a gap between itself and the maxilla called the subnarial gap (also termed a "kink"). Such a gap is also present in coelophysoids. The subnarial gap resulted in a diastema, a gap in the tooth row (which has also been called a "notch"). Within the subnarial gap was a deep excavation behind the toothrow of the premaxilla, called the subnarial pit, which was walled by a downwards keel of the premaxilla. The outer surface of the premaxilla was covered in foramina (openings) of varying sizes. The upper of the two backwards extending processes of the premaxilla was long and low, and formed most of the upper border of the elongated naris. It had a dip towards the font, which made the area by its base concave in profile. The underside of the premaxilla containing the alveoli (tooth sockets) was oval. The maxilla was shallow, and was depressed around the antorbital fenestra (a large opening in front of the eye), forming a recess that was rounded towards the front, and smoother than the rest of the maxilla. A foramen called the preantorbital fenestra opened into this recess at the front bend. Large foramina ran on the side of the maxilla, above the alveoli. A deep nutrient groove ran backwards from the subnarial pit along the base of the interdental plates (or rugosae) of the maxilla. Dilophosaurus bore a pair of high, thin, and arched (or plate-shaped) crests longitudinally on the skull roof. The crests were formed significantly by the lacrimal bones and partially by the nasal bones. The crests extended upwards and gave the appearance of a cassowary with two crests. As a distinct feature, each crest also had a finger-like backwards projection. The upper surface of the nasal bone between the crests was concave, and the nasal part of the crest overlapped the lacrimal part. As only one specimen preserves the shape of the crests, it is unknown if they differed in other individuals. The lacrimal bone had a unique thickened upper rim, where it formed the upper border at the back of the antorbital fenestra. The prefrontal bone formed the roof of the orbit (eye socket), and had an L-shaped bar that made part of the upper surface of the orbit concave. The orbit was oval, and narrow towards the bottom. The jugal bone had two upwards pointing processes, the first of which formed part of the lower margin of the antorbital fenestra, and part of the lower margin of the orbit. A projection from the quadrate bone into the lateral temporal fenestra (opening behind the eye) gave this a reniform (kidney-shaped) outline. The foramen magnum (the large opening at the back of the braincase) was about half the breadth of the occipital condyle, which was itself cordiform (heart-shaped), and had a short neck and a groove on the side. The mandible was slender and delicate at the front, but the articular region (where it connected with the skull) was massive, and the mandible was deep around the mandibular fenestra (an opening on its side). The mandibular fenestra was small in Dilophosaurus, compared to that of coelophysoids. The retroarticular process of the mandible (a backwards projection) was long, and the surangular shelf was strongly horizontal. The dentary bone (the front part of the mandible where most of the teeth there were attached) had an up-curved rather than pointed chin. The chin had a large foramen at the tip, and a row of small foramina ran in rough parallel with the upper edge of the dentary. On the inner side, the mandibular symphysis (where the two halves of the lower jaw connected) was flat and smooth, and showed no sign of being fused with its opposite half. A Meckelian foramen ran along the outer side of the dentary. Dilophosaurus had four teeth in each premaxilla, twelve in each maxilla, and seventeen in each dentary. The teeth were generally long, thin, and recurved, with relatively small bases. They were compressed sideways, oval in cross-section at the base, lenticular (lens-shaped) above, and slightly concave on their outer and inner sides. The largest tooth of the maxilla was either in or near the fourth alveolus, and the height of the tooth crowns decreased hind wards. The first tooth of the maxilla pointed slightly forwards from its alveolus because the lower border of the prexamilla process (which projected backwards towards the maxilla) was upturned. The teeth of the dentary were much smaller than those of the maxilla. The third or fourth tooth in the dentary of Dilophosaurus and some coelophysoids was the largest there, and seems to have fit into the subnarial gap of the upper jaw. Most of the teeth had serrations on the front and back edges, which were offset by vertical grooves, and were smaller at the front. There were 31 to 41 serrations on the front edges, and 29 to 33 on the back. At least the second and third teeth of the premaxilla had serrations, but the fourth tooth did not. The teeth were covered in a thin layer of enamel, 0.1 to 0.15 millimeters (0.0039 to 0.0059 in) thick, which extended far towards their bases. The alveoli were elliptical to almost circular, and all were larger than the bases of the teeth they contained, which may therefore have been loosely held in the jaws. Though the number of alveoli in the dentary would seem to indicate that the teeth were very crowded, they were rather far apart, due to the larger size of their alveoli. The jaws contained replacement teeth at various stages of eruption. The interdental plates between the teeth were very low. Dilophosaurus had 10 cervical (neck), 14 dorsal (back), and 45 caudal (tail) vertebrae. It had a long neck, which was probably flexed nearly 90° by the skull and by the shoulder, holding the skull in a horizontal posture. The cervical vertebrae were unusually light; their centra (the "bodies" of the vertebrae) were hollowed out by pleurocoels (depressions on the sides) and centrocoels (cavities on the inside). The arches of the cervical vertebrae also had chonoses, conical recesses so large that the bones separating them were sometimes paper-thin. The centra were plano-concave, flat to weakly convex at the front and deeply cupped (or concave) at the back, similar to Ceratosaurus. This indicates that the neck was flexible, though it had long, overlapping cervical ribs which were fused to the centra. The cervical ribs were slender and may have bent easily. The atlas bone (the first cervical vertebra which attaches to the skull) had a small, cubic centrum, and had a concavity at the front where it formed a cup for the occipital condyle (protuberance that connects with the atlas vertebra) at the back of the skull. The axis bone (the second cervical vertebra) had a heavy spine, and its postzygapophyses (the processes of the vertebrae that articulated with the prezygapophyses of a following vertebrae) were met by long prezygapophyses that curved upwards from the third cervical vertebra. The centra and spines of the cervical vertebrae were long and low, and the spines had caps that gave the appearance of a Maltese cross (cruciform) when seen from above, a distinctive feature of this dinosaur. The neural spines of the dorsal vertebrae were also low and expanded front and back, which formed strong attachments for ligaments. The sacral vertebrae which occupied the length of the ilium blade did not appear to be fused. The centra of the caudal vertebrae were very consistent in length, but their diameter became smaller towards the back, and they went from elliptical to circular in cross-section. The scapulae (shoulder blades) were moderate in length and concave on their inner sides to follow the body's curvature. The scapulae were wide, particularly the upper part, which was rectangular (or squared off), a unique feature. The coracoids were elliptical, and not fused to the scapulae. The arms were powerful, and had deep pits and stout processes for attachment of muscles and ligaments. The humerus (upper arm bone) was large and slender, with stout epipodials, and the ulna (lower arm bone) was stout and straight, with a stout olecranon. The hands had four fingers: the first was shorter but stronger than the following two fingers, with a large claw, and the two following fingers were longer and slenderer, with smaller claws. The third finger was reduced, and the fourth was vestigial (retained, but without function). The crest of the ilium was highest over the ilial peduncle (the downwards process of the ilium), and its outer side was concave. The foot of the pubic bone was only slightly expanded, whereas the lower end was much more expanded on the ischium, which also had a very thin shaft. The hind legs were large, with a slighter longer femur (thigh bone) than tibia (lower leg bone), the opposite of, for example, Coelophysis. The femur was massive; its shaft was sigmoid-shaped (curved like an S), and its greater trochanter was centered on the shaft. The tibia had a developed tuberosity and was expanded at the lower end. The astragalus bone (ankle bone) was separated from the tibia and the calcaneum, and formed half of the socket for the fibula. It had long, stout feet with three well-developed toes that bore large claws. The third toe was the stoutest, and the smaller first toe (the hallux) was kept off the ground. Front part of holotype cast, ROM; the skull, crests, and pelvis are reconstructed, the neck straightened, the left leg moved up, and the tail has been curved upwards. The rest of the skeleton is in the position of burial. In the summer of 1942, the American paleontologist Charles L. Camp led a field party from the University of California Museum of Paleontology (UCMP) in search of fossil vertebrates in Navajo County in northern Arizona. Word of this was spread among the Native Americans there, and the Navajo Jesse Williams brought three members of the expedition to some fossil bones he had discovered in 1940. The area was part of the Kayenta Formation, about 32 kilometers (20 mi) north of Cameron near Tuba City in the Navajo Indian Reservation. Three dinosaur skeletons were found in purplish shale, arranged in a triangle, about 9.1 meters (30 ft) long at one side. The first was nearly complete, lacking only the front of the skull, parts of the pelvis, and some vertebrae. The second was very eroded, included the front of the skull, lower jaws, some vertebrae, limb bones, and an articulated hand. The third was so eroded that it consisted only of vertebra fragments. The first good skeleton was encased in a block of plaster after ten days of work and loaded onto a truck, the second skeleton was easily collected as it was almost entirely weathered out of the ground, but the third skeleton was almost gone. The nearly complete first specimen was cleaned and mounted at the UCMP under supervision of the American paleontologist Wann Langston Jr., a process that took three men two years. The skeleton was wall-mounted in bas relief, with the tail curved upwards, the neck straightened, and the left leg moved up for visibility, but the rest of the skeleton was kept in its burial position. As the skull was crushed, it was reconstructed based on the back of the skull of the first specimen and the front of the second. The pelvis was reconstructed after that of Allosaurus, and the feet were also reconstructed. At the time, it was one of the best-preserved skeletons of a theropod dinosaur, though incomplete. In 1954 the American paleontologist Samuel P. Welles, who was part of the group that excavated the skeletons, preliminarily described and named this dinosaur as a new species in the existing genus Megalosaurus, M. wetherilli. The nearly complete specimen (catalogued as UCMP 37302) became the holotype, and the second specimen (UCMP 37303) was included in the hypodigm (the sample of specimens that defines a taxon) of the species. The specific name honored John Wetherill, a Navajo councilor whom Welles described as an "explorer, friend of scientists, and trusted trader". It was Wetherill's nephew, Milton, who had first informed the expedition of the fossils. Welles placed the new species in Megalosaurus due to the similar limb proportions of it and M. bucklandii, and because he did not find great differences between them. At the time, Megalosaurus was used as a "wastebasket taxon", wherein many species of theropod were placed, regardless of their age or locality. Welles returned to Tuba City in 1964 to determine the age of the Kayenta Formation (it had been suggested to be Late Triassic in age, whereas Welles thought it was Early to Middle Jurassic), and discovered another skeleton about 0.25 miles (0.40 km) south of where the 1942 specimens had been found. The nearly complete specimen (catalogued as UCMP 77270) was collected with the help of William Breed of the Museum of Northern Arizona and others. During preparation of this specimen, it became clear that it was a larger individual of M. wetherilli, and that it would have had two crests on the top of its skull. Being a thin plate of bone, one crest was originally thought to be part of the missing left side of the skull which had been pulled out of its position by a scavenger. When it became apparent that it was a crest, it was also realized that there would have been a corresponding crest on the left side, since the right crest was right of the midline, and was concave along its middle length. This discovery led to reexamination of the holotype specimen, which was found to have bases of two thin, upwards extended bones, which were crushed together. These also represented crests, but it had formerly been assumed they were part of a misplaced cheek bone. It was also concluded that the two 1942 specimens were juveniles, while the 1964 specimen was an adult, about one third larger than the others. Welles later recalled that he thought the crests were as unexpected as finding "wings on a worm". Welles and an assistant subsequently corrected the wall mount of the holotype specimen based on the new skeleton, by restoring the crests, redoing the pelvis, making the neck ribs longer, and placing them closer together. After studying the skeletons of North American and European theropods, Welles realized that the dinosaur did not belong to Megalosaurus, and needed a new genus name. At this time, no other theropods with large longitudal crests on their heads were known, and the dinosaur had therefore gained the interest of paleontologists. A mold of the holotype specimen was made, and fiberglass casts of it were distributed to various exhibits; to make labeling these casts easier, Welles decided to name the new genus in a brief note, rather than wait until the publication of a detailed description. In 1970 Welles coined the new genus name Dilophosaurus, from the Greek words di (δι) meaning "two", lophos (λόφος) meaning "crest", and sauros (σαυρος) meaning "lizard"; "two-crested lizard". Welles published a detailed osteological description of Dilophosaurus in 1984, but the 1964 specimen has not yet been properly described. Dilophosaurus was the first well-known theropod from the Early Jurassic, and remains one of the best-preserved examples of that age. In 2001 the American paleontologist Robert J. Gay identified the remains of at least three new Dilophosaurus specimens (this number is based on the presence of three pubic bone fragments and two differentially sized femora) in the collections of the Museum of Northern Arizona. The specimens were found in 1978 in the Rock Head Quadrangle, 190 kilometers (120 mi) away from where the original specimens were found, and had been labeled as a "large theropod". Though most of the material is damaged, it is significant in including elements not preserved in the earlier specimens, including part of the pelvis and several ribs. Some elements in the collection belonged to an infant specimen (MNA P1.3181), the youngest known example of this genus, and one of the earliest known infant theropods from North America, only preceded by some Coelophysis specimens. The juvenile specimen includes a partial humerus, a partial fibula, and a tooth fragment. In 2005 the American paleontologist Ronald S. Tykoski assigned a specimen (TMM 43646-140) from Gold Spring, Arizona, to Dilophosaurus, but in 2012 the American paleontologist Matthew T. Carrano and colleagues found it to differ in some details. In 1984 Welles suggested that the 1964 specimen (UCMP 77270) did not belong to Dilophosaurus, but to a new genus, based on differences in the skull, vertebrae, and femora. He maintained that both genera bore crests, but that the exact shape of these was unknown in Dilophosaurus. Welles died in 1997, before he could name this supposed new dinosaur, but the idea that the two were separate genera has generally been ignored or forgotten since. In 1999 the American amateur paleontologist Stephan Pickering privately published the new name Dilophosaurus "breedorum" based on the 1964 specimen, named in honor of Breed, who had assisted in collecting it. This name is considered a nomen nudum, an invalidly published name, and Gay pointed out in 2005 that there are no significant differences between D. "breedorum" and other D. wetherilli specimens. Carrano and colleagues found differences between the 1964 specimen and the holotype specimen, but attributed them to variation between individuals rather than species. A nearly complete theropod skeleton (KMV 8701) was discovered in the Lufeng Formation, in Yunnan Province, China, in 1987. It is similar to Dilophosaurus, with a pair of crests and a gap separating the premaxilla from the maxilla, but differs in some details. The Chinese paleontologist Shaojin Hu named it as a new species of Dilophosaurus in 1993, D. sinensis (from Greek Sinai, referring to China). In 1998 the American paleontologist Matthew C. Lamanna and colleagues found D. sinensis to be identical to Sinosaurus triassicus, a theropod from the same formation, named in 1940. This conclusion was confirmed by the Chinese paleontologist Lida Xing and colleagues in 2013, and though the Chinese paleontologist Guo-Fu Wang and colleagues agreed the species belonged in Sinosaurus in 2017, they suggested it may be a separate species, S. sinensis. Various ichnotaxa (taxa based on trace fossils) have been attributed to Dilophosaurus or similar theropods. In 1971 Welles reported dinosaur footprints from the Kayenta Formation of northern Arizona, on two levels 14 meters (45 ft) and 112 meters (367 ft) below where the original Dilophosaurus specimens were found. The lower footprints were tridactyl (three-toed), and could have been made by Dilophosaurus; Welles created the new ichnogenus and species Dilophosauripus williamsi based on them, in honor of Williams, the discoverer of the first Dilophosaurus skeletons. The type specimen is a cast of a large footprint catalogued as UCMP 79690-4, with casts of three other prints included in the hypodigm. In 1984 Welles conceded that there was no way to prove or disprove that the footprints belonged to Dilophosaurus. In 1996 the American paleontologists Michael Morales and Scott Bulkey reported a trackway of the ichnogenus Eubrontes from the Kayenta Formation made by a very large theropod. They noted it could have been made by a very large Dilophosaurus individual, but found that unlikely, as they estimated the trackmaker would have been 2.83–2.99 meters (9 ft 3 in–9 ft 10 in) tall at the hips, compared to the 1.50–1.75 meters (4 ft 11 in–5 ft 9 in) of Dilophosaurus. The Polish paleontologist Gerard Gierliński examined tridactyl footprints from the Holy Cross Mountains in Poland and concluded in 1991 that they belonged to a theropod like Dilophosaurus. He named the new ichnospecies Grallator (Eubrontes) soltykovensis based on them, with a cast of footprint MGIW 1560.11.12 as the holotype. In 1994 Gierliński also assigned footprints from the Höganäs Formation in Sweden discovered in 1974 to G. (E.) soltykovensis. In 1996, Gierliński attributed track AC 1/7 from the Turners Falls Formation of Massachusetts, a resting trace he believed to show feather impressions, to a theropod similar to Dilophosaurus and Liliensternus, and assigned it to the ichnotaxon Grallator minisculus. The Czech paleontologist Martin Kundrát agreed that the track showed feather impressions in 2004, but this interpretation was disputed by the American paleontologists Martin Lockley and colleagues in 2003 and Anthony J. Martin and colleagues in 2004, who considered them as sedimentological artifacts. Martin and colleagues also reassigned the track to the ichnotaxon Fulicopus lyellii. The American paleontologist Robert E. Weems proposed in 2003 that Eubrontes tracks were not produced by a theropod but by a sauropodomorph similar to Plateosaurus, excluding Dilophosaurus as a possible trackmaker. Instead, Weems proposed Kayentapus hopii, another ichnotaxon named by Welles in 1971, as the best match for Dilophosaurus. The attribution to Dilophosaurus was primarily based on the wide angle between digit impressions three and four shown by these tracks, and the observation that the foot of the holotype specimen shows a similarly splayed-out fourth digit. Also in 2003, the American paleontologist Emma Rainforth argued that the splay in the holotype foot was merely the result of distortion, and that Eubrontes would indeed be a good match for Dilophosaurus. The American paleontologist Spencer G. Lucas and colleagues stated in 2006 that there was virtually uiversal agreement that Eubrontes tracks were made by a theropod like Dilophosaurus, and that they and other researchers dismissed Weems claims. In 2006, Weems defended his 2003 assessment of Eubrontes, and proposed an animal like Dilophosaurus as possible trackmaker of numerous Kayentapus trackways of the Culpeper Quarry in Virginia. Weems suggested rounded impressions associated with some of these trackways to represent hand impressions lacking digit traces, which he interpreted as a trace of quadrupedal movement. In 2009 the American paleontologists Andrew R. C. Milner and colleagues used the new combination Kayentapus soltykovensis, and suggested that Dilophosauripus may not be distinct from Eubrontes and Kayentapus. They suggested that the long claw marks that were used to distinguish Dilophosauripus may be an artifact of dragging. They found that Gigandipus and Anchisauripus tracks may likewise also just represent variations of Eubrontes. They pointed out that differences between ichnotaxa may reflect how the track-maker interacted with the substrate rather than taxonomy. They also found Dilophosaurus a suitable match for a Eubrontes trackway and resting trace (SGDS.18.T1) from the St. George Dinosaur Discovery Site in the Moenave Formation of Utah, though the dinosaur itself is not known from the formation, which is slightly older than the Kayenta Formation. Weems stated in 2019 that Eubrontes tracks do not reflect the gracile feet of Dilophosaurus, and argued they were instead made by the bipedal sauropodopormph Anchisaurus. Welles thought Dilophosaurus a megalosaur in 1954, but revised his opinion in 1970 after discovering that it had crests. By 1974, Welles and the American paleontologist Robert A. Long found Dilophosaurus to be a ceratosauroid. In 1984 Welles found that Dilophosaurus exhibited features of both coelurosauria and carnosauria, the two main groups into which theropods had hitherto been divided, based on body size, and he suggested this division was inaccurate. He found Dilophosaurus to be closest to those theropods that were usually placed in the family Halticosauridae, particularly Liliensternus. In 1988 the American paleontologist Gregory S. Paul classified the halticosaurs as a subfamily of the family Coelophysidae, and suggested that Dilophosaurus could have been a direct descendant of Coelophysis. Paul also considered the possibility that spinosaurs were late surviving dilophosaurs, based on similarity of the kinked snout, nostril position, and slender teeth of Baryonyx. In 1994 the American paleontologist Thomas R. Holtz placed Dilophosaurus in the group Coelophysoidea, along with but separate from Coelophysidae. He placed Coelophysoidea itself in the group Ceratosauria. In 2000 the American paleontologist James H. Madsen and Welles divided Ceratosauria into the families Ceratosauridae and Dilophosauridae, with Dilophosaurus as the sole member of the latter family. Lamanna and colleagues pointed out in 1998 that since Dilophosaurus was discovered to have had crests on its skull, other similarly crested theropods have been discovered (including Sinosaurus), and that this feature is therefore not unique to the genus, and of limited use for determining interrelationships within their group. The Australian paleontologist Adam M. Yates described the new genus Dracovenator from South Africa in 2005, and found it closely related to Dilophosaurus and Zupaysaurus. His cladistic analysis suggested they did not belong in Coelophysoidea, but rather in Neotheropoda, a more derived (or "advanced") group. He proposed that if Dilophosaurus was more derived than Coelophysoidea, the features it shared with this group may have been inherited from basal (or "primitive") theropods, indicating that theropods may have passed through a "coelophysoid stage" in their early evolution. In 2007 the American paleontologist Nathan D. Smith and colleagues found the crested theropod Cryolophosaurus to be the sister species of Dilophosaurus, and grouped them with Dracovenator and Sinosaurus. This clade was more derived than Coelophysoidea, but more basal than Ceratosauria, thereby placing basal theropods in a ladder-like arrangement. In 2012 Carrano and colleagues found that the group of crested theropods proposed by Smith and colleagues was based on features that relate to the presence of such crests, but that the features of the rest of the skeleton were less consistent. They instead found that Dilophosaurus was a coelophysoid, with Cryolophosaurus and Sinosaurus being more derived, as basal members of the group Tetanurae. Welles envisioned Dilophosaurus as an active, clearly bipedal animal, similar to an enlarged ostrich. He found the forelimbs to have been powerful weapons, strong and flexible, and not used for locomotion. He noted that the hands were capable of grasping and slashing, of meeting each other, and reaching two thirds up the neck. He proposed that in a sitting posture, the animal would rest on the large "foot" of its ischium, as well as its tail and feet. In 1990 the American paleontologists Stephen and Sylvia Czerkas suggested that the weak pelvis of Dilophosaurus could have been an adaptation for an aquatic life-style, where the water would help support its weight, and that it could have been an efficient swimmer. They found it doubtful that it would have been restricted to a watery environment, though, due to the strength and proportions of its hind-limbs, which would have made it fleet-footed and agile during bipedal locomotion. In 2005 the American paleontologists Phil Senter and James H. Robins examined the range of motion in the forelimbs of Dilophosaurus and other theropods. They found that Dilophosaurus would have been able to draw its humerus backwards until it was almost parallel with the scapula, but could not move it forwards to a more than vertical orientation. The elbow could approach full extension and flexion at a right angle, but not achieve it completely. The fingers do not appear to have been voluntarily hyperextensible (able to extend backwards, beyond their normal range), but they may have been passively hyperextensible, to resist dislocation during violent movements by captured prey. A 2015 article by Senter and Robins gave recommendations for how to reconstruct the forelimb posture in bipedal dinosaurs, based on examination of various taxa, including Dilophosaurus. The scapulae were held very horizontally, the resting orientation of the elbow would have been close to a right angle, and the orientation of the hand would not have deviated much from that of the lower arm. The Dilophosauripus footprints reported by Welles in 1971 were all on the same level, and were described as a "chicken yard hodge-podge" of footprints, with few forming a trackway. The footprints had been imprinted in mud, which allowed the feet to sink down 5–10 centimeters (2.0–3.9 in). The prints were sloppy, and the varying breadth of the toe prints indicates that mud had clung to the feet. The impressions varied according to differences in the substrate and the manner in which they were made; sometimes the foot was planted directly, but there was often a backwards or forwards slip as the foot came down. The positions and angles of the toes also varied considerably, which indicates they must have been quite flexible. The Dilophosauripus footprints had an offset second toe with a thick base, and very long, straight claws that were in line with the axes of the toe-pads. One of the footprints was missing the claw of the second toe, perhaps due to injury. In 1984 Welles interpreted the fact that three individuals were found closely together, and the presence of criss-crossed trackways nearby, as indications that Dilophosaurus traveled in groups. Gay agreed that they may have traveled in small groups, but noted that there was no direct evidence for this, and that flash floods could have picked up scattered bones from different individuals and deposited them together. Milner and colleagues examined the Utah trackway SGDS.18.T1 in 2009, which consists of typical footprints with tail drags and a more unusual resting trace, deposited in lacustrine beach sandstone. The trackway began with the animal first oriented approximately in parallel with the shoreline, and then stopping by a berm with both feet in parallel, whereafter it lowered its body, and brought its metatarsals and the callosity around its ischium to the ground; this created impressions of symmetrical "heels" and circular impressions of the ischium. The part of the tail closest to the body was kept off the ground, whereas the end further away from the body made contact with the ground. The fact that the animal rested on a slope is what enabled it to bring both hands to the ground close to the feet. After resting, the dinosaur shuffled forwards, and left new impressions with its feet, metatarsals, and ischium, but not the hands. The right foot now stepped on the print of the right hand, and the second claw of the left foot made a drag mark from the first resting position to the next. After some time, the animal stood up and moved forwards, with the left foot first, and once fully erect, it walked across the rest of the exposed surface, while leaving thin drag marks with the end of the tail. Crouching is a rarely captured behavior of theropods, and SGDS.18.T1 is the only such track with unambiguous impressions of theropod hands, which provides valuable information about how they used their forelimbs. The crouching posture was found to be very similar to that of modern birds, and shows that early theropods held the palms of their hands facing medially, towards each other. As such a posture therefore evolved early in the lineage, it may have characterized all theropods. Theropods are often depicted with their palms facing downwards, but studies of their functional anatomy have shown that they, like birds, were unable to pronate or supinate their arms (crossing the radius and ulna bones of the lower arm to turn the hand). The track showed that the legs were held symmetrically with the body weight distributed between the feet and the metatarsals, which is also a feature seen in birds such as ratites. Milner and colleagues also dismissed the idea that the Kayentapus minor track reported by Weems showed a palm imprint made by a quadrupedally walking theropod. Weems had proposed the trackmaker would have been able to move quadrupedally when walking slowly, while the digits would have been habitually hyperextended so only the palms touched the ground. Milner and colleagues found the inferred pose unnecessary, and suggested the track was instead made in a similar way as SGDS.18.T1, but without leaving traces of the digits. Welles found that Dilophosaurus did not have a powerful bite, due to weakness caused by the subnarial gap. He thought that it used its front premaxillary teeth for plucking and tearing rather than biting, and the maxillary teeth further back for piercing and slicing. He thought that it was probably a scavenger rather than a predator, and that if it did kill large animals, it would have done so with its hands and feet rather than its jaws. Welles did not find evidence of cranial kinesis in the skull of Dilophosaurus, a feature which allows individual bones of the skull to move in relation to each other. In 1986 the American paleontologist Robert T. Bakker instead found Dilophosaurus, with its massive neck and skull and large upper teeth, to have been adapted for killing large prey, and strong enough to attack any Early Jurassic herbivores. In 1988 Paul dismissed the idea that Dilophosaurus was a scavenger, and claimed that strictly scavenging terrestrial animals are a myth. He stated that the snout of Dilophosaurus was better braced than had been thought previously, and that the very large, slender maxillary teeth were more lethal than the claws. Paul suggested that it hunted large animals such as prosauropods, and that it was more capable of snapping small animals than other theropods of a similar size. Paul also depicted Dilophosaurus bouncing on its tail while lashing out at an enemy, similar to a kangaroo. A 2005 beam-theory study by the Canadian palaeontologist François Therrien and colleagues found that the bite force in the mandible of Dilophosaurus decreased rapidly hind wards in the tooth-throw. This indicates that the front of the mandible, with its upturned chin, "rosette" of teeth, and strengthened symphysal region (similar to spinosaurids), was used to capture and manipulate prey, probably of relatively smaller size. The properties of its mandibular symphysis was similar to those of felids and crocodilians that use the front of their jaws to deliver a powerful bite when subduing prey. The loads exerted on the mandibles were consistent with struggle of small prey, which may have been hunted by delivering slashing bites to wound it, and then captured with the front of the jaws after being too weakened to resist. The prey may then have been moved further back into the jaws, where the largest teeth were located, and killed by slicing bites (similar to some crocodilians) with the sideways compressed teeth. The authors suggested that if Dilophosaurus indeed fed on small prey, possible hunting packs would have been of limited size. Milner and James I. Kirkland suggested in 2007 that Dilophosaurus had features that indicate it may have eaten fish. They pointed out that the ends of the jaws were expanded to the sides, forming a "rosette" of interlocking teeth, similar to those of spinosaurids, known to have eaten fish, and gharials, which is the modern crocodile that eats the most fish. The nasal openings were also retracted back on the jaws, similar to spinosaurids, which have even more retracted nasal openings, and this may have limited water splashing into the nostrils during fishing. Both groups also had long arms with well-developed claws, which could help when catching fish. Lake Dixie, a large lake which extended from Utah to Arizona and Nevada, would have provided abundant fish in the "post-cataclysmic", biologically more impoverished world that followed the Triassic–Jurassic extinction event. Welles conceded that suggestions as to the function of the crests of Dilophosaurus were conjectural, but thought that, though the crests had no grooves to indicate vascularization, they could have been used for thermoregulation. He also suggested they could have been used for species recognition or ornamentation. The Czerkas pointed out that the crests could not have been used during battle, as their delicate structure would have been easily damaged. They suggested that they were a visual display for attracting a mate, and even thermoregulation. In 1990, the American paleontologist Walter P. Coombs stated that the crests may have been enhanced by colors for use in display. In 2011 the American paleontologists Kevin Padian and John R. Horner proposed that "bizarre structures" in dinosaurs in general (including crests, frills, horns, and domes) were primarily used for species recognition, and dismissed other explanations as unsupported by evidence. They noted that too few specimens of cranially ornamented theropods, including Dilophosaurus, were known to test their evolutionary function statistically, and whether they represented sexual dimorphism or sexual maturity. In a response to Padian and Horner the same year, the American paleontologists Rob J. Knell and Scott D. Sampson argued that species recognition was not unlikely as a secondary function for "bizarre structures" in dinosaurs, but that sexual selection (used in display or combat to compete for mates) was a more likely explanation, due to the high cost of developing them, and because such structures appear to be highly variable within species. In 2013 the British paleontologists David E. Hone and Darren Naish criticized the "species recognition hypothesis", and argued that no extant animals use such structures primarily for species recognition, and that Padian and Horner had ignored the possibility of mutual sexual selection (where both sexes are ornamented). Welles originally interpreted the smaller Dilophosaurus specimens as juveniles, and the larger specimen as an adult, later interpreting them as different species. Paul suggested that the differences between the specimens was perhaps due to sexual dimorphism, as was seemingly also apparent in Coelophysis, which had "robust" and "gracile" forms of the same size, that might otherwise have been regarded as separate species. Following this scheme, the smaller Dilophosaurus specimen would represent a "gracile" example. In 2005 Tykoski found that most Dilophosaurus specimens known were juvenile individuals, with only the largest an adult, based on the level of coossification (fusion during bone tissue formation) of the bones. In 2005 Gay found no evidence of the sexual dimorphism suggested by Paul (but supposedly present in Coelophysis), and attributed the variation seen between Dilophosaurus specimens to individual variation and ontogeny (changes during growth). There was no dimorphism in the skeletons, but he did not rule out that there could have been in the crests; more data was needed to determine this. Based on the tiny nasal crests on a juvenile specimen, Yates had tentatively assigned to the related genus Dracovenator, he suggested that these would have grown larger as the animal became adult. The American paleontologist Joe S. Tkach reported a histological study (microscopical study of internal features) of Dilophosaurus in 1996, conducted by taking thin-sections of long bones and ribs of specimen UCMP 37303 (the lesser preserved of the two original skeletons). The bone tissues were well vascularized and had a fibro-lamellar structure similar to that found in other theropods and the sauropodomorph Massospondylus. The plexiform (woven) structure of the bones suggested rapid growth, and Dilophosaurus may have attained a growth rate of 30 to 35 kilograms (66 to 77 lb) per year early in life. Welles found that the replacement teeth of Dilophosaurus and other theropods originated deep inside the bone, decreasing in size the farther they were from the alveolar border. There were usually two or three replacement teeth in the alveoli, with the youngest being a small, hollow crown. The replacement teeth erupted on the outer side of the old teeth. When a tooth neared the gum line, the inner wall between the interdental plates was resorbed and formed a nutrient notch. As the new tooth erupted, it moved outwards to center itself in the alveolus, and the nutrient notch closed over. Welles noted various paleopathologies (ancient signs of disease, such as injuries and malformations) in Dilophosaurus. The holotype had a sulcus (groove or furrow) on the neural arch of a cervical vertebra that may have been due to an injury or crushing, and two pits on the right humerus that may have been abscesses (collections of pus) or artifacts. Welles also noted that it had a smaller and more delicate left humerus than the right, but with the reverse condition in its forearms. In 2001 the Australian paleontologist Ralph Molnar suggested that this was caused by a developmental anomaly called fluctuating asymmetry. This anomaly can be caused by stress in animal populations, for example due to disturbances in their environment, and may indicate more intense selective pressure. Asymmetry can also result from traumatic events in early development of an animal, which would be more randomly distributed in time. A 2001 study conducted by the American paleontologist Bruce Rothschild and colleagues examined 60 Dilophosaurus foot bones for signs of stress fractures (which are caused by strenuous, repetitive actions), but none were found. Such injuries can be the result of very active, predatory lifestyles. In 2016 Senter and Sara L. Juengst examined the paleopathologies of the holotype specimen and found that it bore the greatest and most varied number of such maladies on the pectoral girdle and forelimb of any theropod dinosaur so far described, some of which are not known from any other dinosaur. Only six other theropods are known with more than one paleopathology on the pectoral girdle and forelimbs. The holotype specimen had eight afflicted bones, whereas no other theropod specimen is known with more than four. On its left side it had a fractured scapula and radius, and fibriscesses (like abscesses) in the ulna and the outer phalanx bone of the thumb. On the right side it had torsion of its humeral shaft, three bony tumors on its radius, a truncated articular surface of its third metacarpal bone, and deformities on the first phalanx bone of the third finger. This finger was permanently deformed and unable to flex. The deformities of the humerus and the third finger may have been due to osteodysplasia, which had not been reported from non-avian dinosaurs before, but is known in birds. Affecting juvenile birds that have experienced malnutrition, this disease can cause pain in one limb, which makes the birds prefer to use the other limb instead, which thereby develops torsion. The number of traumatic events that led to these features is not certain, and it is possible that they were all caused by a single encounter, for example by crashing into a tree or rock during a fight with another animal, which may have caused puncture wounds with its claws. Since all the injuries had healed, it is certain that the Dilophosaurus survived for a long time after these events, for months, perhaps years. The use of the forelimbs for prey capture must have been compromised during the healing process. The dinosaur may therefore have endured a long period of fasting or subsisted on prey that was small enough for it to dispatch with the mouth and feet, or with one forelimb. According to Senter and Juengst, the high degree of pain the dinosaur might have experienced in multiple locations for long durations also shows that it was a hardy animal. They noted that paleopathologies in dinosaurs are underreported, and that even though Welles had thoroughly described the holotype, he had mentioned only one of the pathologies found by them. They suggested that such features may sometimes be omitted because descriptions of species are concerned with their characteristics rather than abnormalities, or because such features are difficult to recognize. Dilophosaurus is known from the Kayenta Formation, which dates to the Sinemurian and Pliensbachian stages of the Early Jurassic, approximately 196–183 million years ago. The Kayenta Formation is part of the Glen Canyon Group that includes formations in northern Arizona, parts of southeastern Utah, western Colorado, and northwestern New Mexico. It is composed mostly of two facies, one dominated by siltstone deposition and the other by sandstone. The siltstone facies is found in much of Arizona, while the sandstone facies is present in areas of northern Arizona, southern Utah, western Colorado, and northwestern New Mexico. The formation was primarily deposited by rivers, with the siltstone facies as the slower, more sluggish part of the river system. Kayenta Formation deposition was ended by the encroaching dune field that would become the Navajo Sandstone. A definitive radiometric dating of this formation has not yet been made, and the available stratigraphic correlation has been based on a combination of radiometric dates from vertebrate fossils, magnetostratigraphy, and pollen evidence. The Kayenta Formation has yielded a small but growing assemblage of organisms. Most fossils are from the siltstone facies. Most organisms known so far are vertebrates. Non-vertebrates include microbial or "algal" limestone, petrified wood, plant impressions, freshwater bivalves and snails, ostracods, and invertebrate trace fossils. Vertebrates are known from both body fossils and trace fossils. Vertebrates known from body fossils include hybodont sharks, indeterminate bony fish, lungfish, salamanders, the frog Prosalirus, the caecilian Eocaecilia, the turtle Kayentachelys, a sphenodontian reptile, lizards, and several early crocodylomorphs including Calsoyasuchus, Eopneumatosuchus, Kayentasuchus, and Protosuchus, and the pterosaur Rhamphinion. Apart from Dilophosaurus, several dinosaurs are known, including the theropods Megapnosaurus (a species in need of a new genus name that may also have had crests), and Kayentavenator, the sauropodomorph Sarahsaurus, a heterodontosaurid, and the armored dinosaurs Scelidosaurus and Scutellosaurus. Synapsids include the tritylodontids Dinnebitodon, Kayentatherium, and Oligokyphus, morganucodontids, the possible early true mammal Dinnetherium, and a haramiyid mammal. The majority of these finds come from the vicinity of Gold Spring, Arizona. Vertebrate trace fossils include coprolites and the tracks of therapsids, lizard-like animals, and several types of dinosaur. Welles outlined the taphonomy of the original specimens, changes that happened during their decay and fossilization. The holotype skeleton was found lying on its right side, and its head and neck were recurved – curved backwards – in the "death pose" in which dinosaur skeletons are often found. This pose was thought to be opisthotonus (due to death-spasms) at the time, but may instead have been the result of how a carcass was embedded in sediments. The back was straight, and the hindmost dorsal vertebrae were turned on their left sides. The caudal vertebrae extended irregularly from the pelvis, and the legs were articulated, with little displacement. Welles concluded that the specimens were buried at the place of their deaths, without having been transported much, but that the holotype specimen appears to have been disturbed by scavengers, indicated by the rotated dorsal vertebrae and crushed skull. Gay noted that the specimens he described in 2001 showed evidence of having been transported by a stream. As none of the specimens were complete, they may have been transported over some distance, or have lain on the surface and weathered for some time before transport. They may have been transported by a flood, as indicated by the variety of animals found as fragments and bone breakage. Dilophosaurus was featured in the 1990 novel Jurassic Park, by the American writer Michael Crichton, and its 1993 movie adaptation by the American director Steven Spielberg. The Dilophosaurus of Jurassic Park was acknowledged as the "only serious departure from scientific veracity" in the movie's making-of book, and as the "most fictionalized" of the movie's dinosaurs in a book about Stan Winston Studios, which created the animatronics effects. For the novel, Crichton invented the dinosaur's ability to spit venom (explaining how it was able to kill prey, in spite of its seemingly weak jaws). The art department added another feature, a cowl folded against its neck that expanded and vibrated as the animal prepared to attack, similar to that of the frill-necked lizard. To avoid confusion with the Velociraptor as featured in the movie, Dilophosaurus is presented as only 1.2 meters (4 ft) tall, instead of its assumed true height of about 3.0 meters (10 ft). Nicknamed "the spitter", the Dilophosaurus of the movie was realized through puppeteering, and required a full body with three interchangeable heads to produce the actions required by the script. Separate legs were also constructed for a shot where the dinosaur hops by. Unlike most of the other dinosaurs in the movie, no computer-generated imagery was employed when showing the Dilophosaurus. The American geologist J. Bret Bennington noted that though Dilophosaurus probably did not have a frill and could not spit venom like in the movie, its bite could have been venomous, as has been claimed for the Komodo dragon. He found that adding venom to the dinosaur was no less allowable than giving a color to its skin, which is also unknown. If the dinosaur had a frill, there would have been evidence for this in the bones, in the shape of a rigid structure to hold up the frill, or markings at the places where the muscles used to move it were attached. He also added that if it did have a frill, it would not have used it to intimidate its meal, but rather a competitor (it may have responded to a character in the movie pulling a hood over his head). Welles himself was "thrilled" to see Dilophosaurus in Jurassic Park, and he noted the inaccuracies but found them minor points and enjoyed the movie, and was happy to find the dinosaur "an internationally known actor". In 2017 Dilophosaurus was designated as the state dinosaur of the US state of Connecticut, to become official with the new state budget in 2019. Dilophosaurus was chosen because tracks thought to be made by a related dinosaur were discovered in Rocky Hill in 1966, during excavation for the Interstate Highway 91. The six tracks were assigned to the ichnospecies Eubrontes giganteus, which was made the state fossil of Connecticut in 1991. The area they were found in had been a Triassic lake, and when the significance of the area was confirmed, the highway was rerouted, and the area made a state park named Dinosaur State Park. In 1981 a sculpture of Dilophosaurus, the first life-sized reconstruction of this dinosaur, was donated to the park. Dilophosaurus was proposed as the state dinosaur of Arizona in 1998, but lawmakers suggested Sonorasaurus instead, arguing that Dilophosaurus was not unique to Arizona. Later a compromise was suggested that would recognize both dinosaurs, but the bill died when it was revealed that the Dilophosaurus fossils had been taken without permission from the Navajo Reservation. ^ "Dilophosaurus". Oxford Dictionaries. Oxford University Press. Retrieved 2016-01-21. ^ a b c d e f g h i j k l m n o p q r s t u v w Welles, S. P. (1984). "Dilophosaurus wetherilli (Dinosauria, Theropoda), osteology and comparisons". Palaeontographica Abteilung A. 185: 85–180. ^ a b c d e f Naish, D. (2009). The Great Dinosaur Discoveries. London: A & C Black Publishers Ltd. pp. 94–95. ISBN 978-1-4081-1906-8. ^ a b c d e f g Paul, G. S. (1988). Predatory Dinosaurs of the World. New York: Simon & Schuster. pp. 258, 267–271. ISBN 978-0-671-61946-6. ^ Holtz, T. R. Jr. (2012). Dinosaurs: The Most Complete, Up-to-date Encyclopedia for Dinosaur Lovers of All Ages. New York: Random House. p. 81. ISBN 978-0-375-82419-7. ^ Paul, G. S. (2010). The Princeton Field Guide to Dinosaurs. Princeton: Princeton University Press. p. 75. ISBN 978-0-691-13720-9. ^ a b Gierliński, G. (1996). "Feather-like impressions in a theropod resting trace from the Lower Jurassic of Massachusetts". Museum of Northern Arizona Bulletin. 60: 179–184. ^ a b Kundrát, M. (2004). "When did theropods become feathered?—Evidence for pre-Archaeopteryx feathery appendages". Journal of Experimental Zoology Part B: Molecular and Developmental Evolution. 302B (4): 355–364. doi:10.1002/jez.b.20014. PMID 15287100. ^ a b Lockley, M.; Matsukawa, M.; Jianjun, L. (2003). "Crouching theropods in taxonomic jungles: ichnological and ichnotaxonomic investigations of footprints with metatarsal and ischial impressions". Ichnos. 10 (2–4): 169–177. doi:10.1080/10420940390256249. ^ a b Martin, A. J.; Rainforth, E. C. (2004). "A theropod resting trace that is also a locomotion trace: case study of Hitchcock's specimen AC 1/7". Geological Society of America Abstracts with Programs. 36 (2): 96. ^ a b c d e Tykoski, R. S.; Rowe, T. (2004). "Ceratosauria". In Weishampel, D. B.; Dodson, P.; Osmolska, H. (eds.). The Dinosauria (2 ed.). Berkeley: University of California Press. pp. 47–70. ISBN 978-0-520-24209-8. ^ a b c d e f Welles, S. P. (1970). "Dilophosaurus (Reptilia: Saurischia), a new name for a dinosaur". Journal of Paleontology. 44 (5): 989. JSTOR 1302738. ^ a b c d Carrano, M. T.; Benson, R. B. J.; Sampson, S. D. (2012). "The phylogeny of Tetanurae (Dinosauria: Theropoda)". Journal of Systematic Palaeontology. 10 (2): 211–300. doi:10.1080/14772019.2011.630927. ^ a b Rauhut, O. W. (2004). "The interrelationships and evolution of basal theropod dinosaurs". Special Papers in Palaeontology. 69: 213. ^ a b c d Gay, R. (2001). "New specimens of Dilophosaurus wetherilli (Dinosauria: Theropoda) from the early Jurassic Kayenta Formation of northern Arizona". Western Association of Vertebrate Paleontologists Annual Meeting Volume Mesa, Arizona. 1: 1. ^ Welles, S. P. (1983). "Two centers of ossification in a theropod astragalus". Journal of Paleontology. 57 (2): 401. JSTOR 1304663. ^ a b c Welles, S. P. (1954). "New Jurassic dinosaur from the Kayenta Formation of Arizona". Bulletin of the Geological Society of America. 65 (6): 591–598. Bibcode:1954GSAB...65..591W. doi:10.1130/0016-7606(1954)65[591:NJDFTK]2.0.CO;2. ^ Welles, S. P.; Guralnick, R. P. (1994). "Dilophosaurus Discovered". ucmp.berkeley.edu. University of California, Berkeley. Archived from the original on 26 March 2018. Retrieved 13 February 2018. ^ a b Welles, S. P.; Guralnick, R. P. (1994). "Dilophosaurus Details". ucmp.berkeley.edu. University of California, Berkeley. Archived from the original on 26 March 2018. Retrieved 13 February 2018. ^ Psihoyos, L.; Knoebber, J. (1994). Hunting Dinosaurs. London: Cassell. pp. 86–89. ISBN 978-0679431244. ^ a b Glut, D. F. (1997). Dinosaurs: The Encyclopedia. Jefferson: McFarland & Company, Inc. Publishers. pp. 347–350. ISBN 978-0786472222. ^ a b c Tykoski, R. S. (2005). "Anatomy, ontogeny, and phylogeny of coelophysoid theropods". UT Electronic Theses and Dissertations: 1–232. ^ a b Gay, R. (2005). "Evidence for sexual dimorphism in the Early Jurassic theropod dinosaur, Dilophosaurus and a comparison with other related forms". In Carpenter, K. (ed.). The Carnivorous Dinosaurs. Bloomington: Indiana University Press. pp. 277–283. ISBN 978-0-253-34539-4. ^ Mortimer, M. "Pickering's taxa 6: Dilophosaurus breedorum". Theropoddatabase.blogspot.com. Archived from the original on 26 March 2018. Retrieved 29 December 2017. ^ Hu, S. (1993). "A short report on the occurrence of Dilophosaurus from Jinning County, Yunnan Province". Vertebrata PalAsiatica. 1 (in Chinese) (1 ed.). 31: 65–69. ^ a b Lamanna, M. C.; Holtz, T. R. Jr; Dodson, P. (1998). "A reassessment of the Chinese theropod dinosaur Dilophosaurus sinensis: Abstracts of Papers. Fifty-Eighth Annual Meeting, Society of Vertebrate Paleontology". Journal of Vertebrate Paleontology. 18 (3): 57–58. JSTOR 4523942. ^ Xing, L.; Bell, P. R.; Rothschild, B. M.; Ran, H.; Zhang, J.; Dong, Z.; Zhang, W.; Currie, P. J. (2013). "Tooth loss and alveolar remodeling in Sinosaurus triassicus (Dinosauria: Theropoda) from the Lower Jurassic strata of the Lufeng Basin, China". Chinese Science Bulletin. 58 (16): 1931. Bibcode:2013ChSBu..58.1931X. doi:10.1007/s11434-013-5765-7. ^ Guo-Fu Wang; Hai-Lu You; Shi-Gang Pan; Tao Wang (2017). "A new crested theropod dinosaur from the Early Jurassic of Yunnan Province, China". Vertebrata PalAsiatica. 55 (2): 177–186. ^ a b Welles, S. P. (1971). "Dinosaur footprints from the Kayenta Formation of northern Arizona". Plateau. 44: 27–38. ^ Morales, M.; Bulkley, S. (1996). "Paleoichnological evidence for a theropod dinosaur larger than Dilophosaurus in the Lower Jurassic Kayenta Formation. The Continental Jurassic". Museum of Northern Arizona Bulletin. 60: 143–145. ^ Gierliński, G. (1991). "New dinosaur ichnotaxa from the Early Jurassic of the Holy Cross Mountains, Poland". Palaeogeography, Palaeoclimatology, Palaeoecology. 85 (1–2): 137–148. Bibcode:1991PPP....85..137G. doi:10.1016/0031-0182(91)90030-U. ^ Gierliński, G.; Ahlberg, A. (1994). "Late triassic and early jurassic dinosaur footprints in the Höganäs Formation of southern Sweden". Ichnos. 3 (2): 99. doi:10.1080/10420949409386377. ^ Weems, R. E. (2003). "Plateosaurus foot structure suggests a single trackmaker for Eubrontes and Gigandipus footprints". In LeTourneau, P. M.; Olsen, P. E. (eds.). The Great Rift Valleys of Pangea in Eastern North America. 2. New York: Columbia University Press. pp. 293–313. ISBN 978-0231126762. ^ Rainforth, E. C. (2003). "Revision and re-evaluation of the Early Jurassic dinosaurian ichnogenus Otozoum". Palaeontology. 46 (4): 803–838. doi:10.1111/1475-4983.00320. ^ a b Weems, R. E. (2006). "The manus print of Kayentapus minor; its bearing on the biomechanics and ichnotaxonomy of Early Mesozoic saurischian dinosaurs". New Mexico Museum of Natural History and Science Bulletin. 37: 369–378. ^ Lucas, S. G.; Klein, H.; Lockley, M. G.; Spielmann, J. A.; Gierlinksi, G. D.; Hunt, A. P.; Tanner, L. H (2006). "Triassic–Jurassic stratigraphic distribution of the theropod footprint ichnogenus Eubrontes". New Mexico Museum of Natural History and Science Bulletin. 37. ^ a b c Milner, A. R. C.; Harris, J. D.; Lockley, M. G.; Kirkland, J. I.; Matthews, N. A.; Harpending, H. (2009). "Bird-like anatomy, posture, and behavior revealed by an Early Jurassic theropod dinosaur resting trace". PLOS One. 4 (3): e4591. Bibcode:2009PLoSO...4.4591M. doi:10.1371/journal.pone.0004591. PMC 2645690. PMID 19259260. ^ Weems, R. E. (2019). "Evidence for bipedal prosauropods as the likely Eubrontes track-makers". Ichnos: 1–29. doi:10.1080/10420940.2018.1532902. ^ Welles, S. P.; Long, R. A. (1974). "The tarsus of theropod dinosaurs". Annals of the South African Museum. Annale van die Suid-Afrikaanse Museum. 64: 191–218. ISSN 0303-2515. ^ Holtz Jr., T. R. (1994). "The phylogenetic position of the Tyrannosauridae: implications for theropod systematics". Journal of Paleontology. 68 (5): 1100–1117. doi:10.1017/S0022336000026706. JSTOR 1306180. ^ Madsen, J. H.; Welles, S. P. (2000). "Ceratosaurus (Dinosauria, Theropoda): a revised osteology". Utah Geological Survey: 1–89. ^ a b Yates, A. M. (2005). "A new theropod dinosaur from the Early Jurassic of South Africa and its implications for the early evolution of theropods". Palaeontologia Africana. 41: 105–122. ISSN 0078-8554. ^ Smith, N. D.; Makovicky, P. J.; Hammer, W. R.; Currie, P. J. (2007). "Osteology of Cryolophosaurus ellioti (Dinosauria: Theropoda) from the Early Jurassic of Antarctica and implications for early theropod evolution". Zoological Journal of the Linnean Society. 151 (2): 377–421. doi:10.1111/j.1096-3642.2007.00325.x. ^ Hendrickx, C.; Hartman, S. A.; Mateus, O. (2015). "An overview of non-avian theropod discoveries and classification". PalArch's Journal of Vertebrate Palaeontology. 12 (1): 73. ^ a b Czerkas, S. J.; Czerkas, S. A. (1990). Dinosaurs: a Global View. Limpsfield: Dragons’ World. p. 208. ISBN 978-0-7924-5606-3. ^ Senter, P.; Robins, J. H. (2005). "Range of motion in the forelimb of the theropod dinosaur Acrocanthosaurus atokensis, and implications for predatory behaviour". Journal of Zoology. 266 (3): 307–318. doi:10.1017/S0952836905006989. ^ Senter, P.; Robins, J. H. (2015). "Resting orientations of dinosaur scapulae and forelimbs: a numerical analysis, with implications for reconstructions and museum mounts". PLOS One. 10 (12): e0144036. Bibcode:2015PLoSO..1044036S. doi:10.1371/journal.pone.0144036. PMC 4684415. PMID 26675035. ^ Bakker, R. T. (1986). The Dinosaur Heresies. New York: William Morrow. pp. 263–264. ISBN 978-0-8217-5608-9. ^ Multiple authors (2000). "Color section". In Paul, G. S. (ed.). The Scientific American Book of Dinosaurs. New York: St. Martin's Press. p. 216. ISBN 978-0-312-31008-0. ^ Milner, A.; Kirkland, J. (2007). "The case for fishing dinosaurs at the St. George Dinosaur Discovery Site at Johnson Farm" (PDF). Survey Notes of the Utah Geological Survey. 39: 1–3. ^ Coombs, W. P. (1990). "Behavior patterns of dinosaurs". In Weishampel, D. B.; Osmolska, H.; Dodson, P. (eds.). The Dinosauria (1st ed.). Berkeley: University of California Press. p. 42. ISBN 978-0-520-06727-1. ^ Padian, K.; Horner, J. R. (2011). "The evolution of 'bizarre structures' in dinosaurs: biomechanics, sexual selection, social selection or species recognition?". Journal of Zoology. 283 (1): 3–17. doi:10.1111/j.1469-7998.2010.00719.x. ^ Knell, R. J.; Sampson, S. (2011). "Bizarre structures in dinosaurs: species recognition or sexual selection? A response to Padian and Horner" (PDF). Journal of Zoology. 283 (1): 18–22. doi:10.1111/j.1469-7998.2010.00758.x. ^ Hone, D. W. E.; Naish, D. (2013). "The 'species recognition hypothesis' does not explain the presence and evolution of exaggerated structures in non-avialan dinosaurs". Journal of Zoology. 290 (3): 172–180. doi:10.1111/jzo.12035. ^ Tkach, J. S. (1996). "Multi-element osteohistological analysis of Dilphosaurus wetherilli. Abstracts of Papers, Fifty-sixth Annual Meeting, Society of Vertebrate Paleontology, American Museum of Natural History, New York, New York, October 16–19". Journal of Vertebrate Paleontology. 16 (3): 1A–80A. JSTOR 4523755. ^ Molnar, R. E. (2001). "Theropod paleopathology: a literature survey". In Tanke, D. H.; Carpenter, K. (eds.). Mesozoic Vertebrate Life. Bloomington: Indiana University Press. pp. 337–363. ISBN 978-0-253-33907-2. ^ Rothschild, B.; Tanke, D. H.; Ford, T. L. (2001). "Theropod stress fractures and tendon avulsions as a clue to activity". In Tanke, D. H.; Carpenter, K. (eds.). Mesozoic Vertebrate Life. Bloomington: Indiana University Press. pp. 331–336. ISBN 978-0253339072. ^ a b Senter, P.; Juengst, S. L.; Heymann, D. (2016). "Record-breaking pain: the largest number and variety of forelimb bone maladies in a theropod dinosaur". PLOS One. 11 (2): e0149140. Bibcode:2016PLoSO..1149140S. doi:10.1371/journal.pone.0149140. PMC 4765892. PMID 26909701. ^ a b J. M., Clark; Fastovsky, D. E. (1986). "Vertebrate biostratigraphy of the Glen Canyon Group in northern Arizona". In Fraser, N. C.; Sues, H.-D. (eds.). The Beginning of the Age of the Dinosaurs: Faunal Change Across the Triassic-Jurassic Boundary. Cambridge: Cambridge University Press. pp. 285–301. ISBN 978-0-521-36779-0. ^ a b Harshbarger, J. W.; Repenning, C. A.; Irwin, J. H. (1957). "Stratigraphy of the uppermost Triassic and the Jurassic rocks of the Navajo country". New Mexico Geological Society. 291: 98–114. ^ a b c Lucas, S. G.; Heckert, A. B.; Tanner, L. H. (2005). "Arizona's Jurassic fossil vertebrates and the age of the Glen Canyon Group". New Mexico Museum of Natural History Bulletins. 29: 95–104. ^ a b c Luttrell, P. R.; Morales, M. (1993). "Bridging the gap across Moenkopi Wash: a lithostratigraphic correlation". Museum of Northern Arizona Bulletin. 59: 111–127. ^ a b Jenkins, F. A.; Shubin, N. H. (1998). "Prosalirus bitis and the anuran caudopelvic mechanism". Journal of Vertebrate Paleontology. 18 (3): 495–510. doi:10.1080/02724634.1998.10011077. ^ Rigby, J. K.; Hamblin, W. K.; Matheny, R.; Welsh, S. L. (1971). "Guidebook to the Colorado river: part 3, Moab to Hite, Utah through Canyonlands National Park" (PDF). Brigham Young University Research Studies, Geology Series. 18 (2): 7. ^ Lucas, S. G.; Tanner, L. H. (2007). "Tetrapod biostratigraphy and biochronology of the Triassic–Jurassic transition on the southern Colorado Plateau, USA". Palaeogeography, Palaeoclimatology, Palaeoecology. 244 (1–4): 242–256. Bibcode:2007PPP...244..242L. doi:10.1016/j.palaeo.2006.06.030. ^ Curtis, K.; Padian, K. (1999). "An Early Jurassic microvertebrate fauna from the Kayenta Formation of northeastern Arizona: microfaunal change across the Triassic-Jurassic boundary". PaleoBios. 19 (2): 19–37. ^ a b Jenkins, F. A.; Crompton, A. W.; Downs, W. R. (1983). "Mesozoic mammals from Arizona: new evidence on mammalian evolution". Science. 222 (4629): 1233–1235. Bibcode:1983Sci...222.1233J. doi:10.1126/science.222.4629.1233. PMID 17806725. ^ Gay, R. (2010). "Kayentavenator elysiae, a new tetanuran from the early Jurassic of Arizona". In Gay, R. (ed.). Notes on Early Mesozoic Theropods. on-demand online press: Lulu Press. pp. 27–43. ISBN 978-0557466160. ^ Rowe, T. B.; Sues, H.-D.; Reisz, R. R. (2010). "Dispersal and diversity in the earliest North American sauropodomorph dinosaurs, with a description of a new taxon". Proceedings of the Royal Society B: Biological Sciences. 278 (1708): 1044–1053. doi:10.1098/rspb.2010.1867. PMC 3049036. PMID 20926438. ^ Hamblin, A. H.; Foster, J. R. (2000). "Ancient animal footprints and traces in the Grand Staircase–Escalante National Monument, south-central Utah". In Sprinkel, D. A.; Chidsey, T. C., Jr.; Anderson, P. B. (eds.). Geology of Utah's Parks and Monuments. Salt Lake City: Utah Geological Association. pp. 557–568. ISBN 978-1882054107. ^ Reisdorf, A. G.; Wuttke, M. (2012). "Re-evaluating Moodie's opisthotonic-posture hypothesis in fossil vertebrates Part I: reptiles—the taphonomy of the bipedal dinosaurs Compsognathus longipes and Juravenator starki from the Solnhofen archipelago (Jurassic, Germany)". Palaeobiodiversity and Palaeoenvironments. 92 (1): 119–168. doi:10.1007/s12549-011-0068-y. ^ Crichton, M. (1990). Jurassic Park. London: Random Century Group. pp. 76–78. ISBN 978-0-394-58816-2. ^ Shay, D.; Duncan, J. (1993). The Making of Jurassic Park. New York: Boxtree Ltd. pp. 24, 35–36, 113. ISBN 978-1-85283-774-7. ^ Duncan, J. (2007). The Winston Effect: The Art and History of Stan Winston Studio. London: Titan Books. pp. 177–178. ISBN 978-1-84576-150-9. ^ Bennington, J. B. (1996). "Errors in the movie Jurassic Park". American Paleontologist. 4 (2): 4–7. ^ Welles, S. P.; Guralnick, R. P. (1994). "Dilophosaurus, the actor". ucmp.berkeley.edu. University of California, Berkeley. Archived from the original on 26 March 2018. Retrieved 13 February 2018. ^ Stone, M. (2017). "Connecticut welcomes its new state dinosaur". ctboom.com. Retrieved 13 February 2018. ^ Rogers, O. (2016). "Discovered dinosaur tracks re-route highway and lead to state park". connecticuthistory.org. Retrieved 3 January 2018. ^ Gebers, S. (2018). "Arizona has no official state dinosaur, so an 11-year-old proposed one — the Sonorasaurus". azcentral. Retrieved 20 February 2018.